Today’s another LIVE podcast broadcast (on-the-go) from MYCity…NYC. 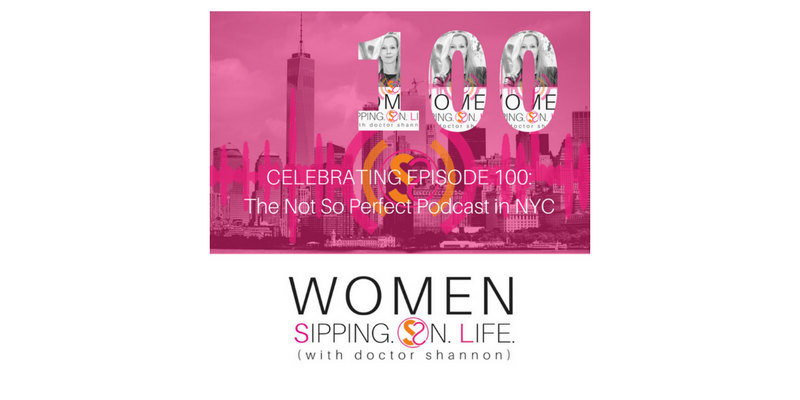 This episode marks our 100th birthday of WOMEN SIPPING. ON. LIFE. (with doctor shannon) AND my “1/2 Way To 100” Birthday! Thanks for being with me every step of the way over the past 100 episodes! Since I’ll be on the fly all day…our show notes are going to be short and sweet today. Thanks for your understanding, love, and patience. 1. What would you do if you didn’t have to do it perfectly? AND…failure and quitting weren’t an option? 2. Please come over to WomenSippingOnLife.com and let me know how the podcast has been of value to you. How has sipping on life been a benefit to you? Please let me know if there’s anything you’d like to hear more of in the future. I love and appreciate you! I’m so very thankful for you! Thanks for celebrating this 100th episode and 50th birthday with me. Thank you SO MUCH for this beautiful message! Hope your 50th Birthday in NY was wonderful. Your message to keep on going and know that things don’t always have to be “PERFECT” was inspiring for me today.